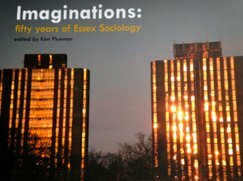 Peter’s lecture to celebrate 25 years of sociology at Essex was one of the best I heard him deliver. I had travelled down from Edinburgh on the sleeper to the event and, maybe because I was still drowsy, agreed to chair his presentation and ensure that he kept to the time. It could be a problem, and others seemed to think that I might be able to handle it. As Peter began speaking, I realised that I could relax. This was something he had very carefully planned: his timing was perfect. Later I learnt from Peter and Jean (Corston) how the piece had evolved. Peter had been invited to the previous congregation when he and Alan Gibson, the first two founding professors, were awarded honorary degrees. In the course of the ceremony both the Vice-Chancellor and the Lord Lieutenant of the County of Essex, who was also being honoured, had referred to Essex having risen above the disreputable days of 1968. Peter had had no opportunity to reply and he was so wound-up on the train going back to Bristol that Jean told him to shut up and write it down. This was the basis for the 1990 lecture. For reasons I have never been able to understand it remained unpublished. Much of it was drawn on in his paper at the 40th celebrations in 2004 – more developed, perhaps, but, in my view it had lost some of its vigour and political edge. See: McDonough, Jo (1978) Listening to Lectures: Sociology, Oxford, Oxford University Press, text and tape.